With four Premier League fixtures on Sunday and eight teams in action, it was all to play for after an average score of just ten points on Saturday evening. Here’s a look at what went on in the AFC Bournemouth fan league, with there now just one game to go before November’s monthly prize gets given out. Fabio Borges sits on top spot with a total score of 862 points, have accumulated a total of 62 in Gameweek 12. Mo Salah as captain proved to be a wise decision, as the Egyptian bagged a goal just before half time against Fulham on Sunday, finishing on 16 points for Fabio’s team. Elsewhere, Manchester City players came up trumps with David Silva bagging nine points and Sergio Aguero’s goal seeing him land seven. At the back, a clean sheet for Marcos Alonso saw him end on eight points, while Lukasz Fabianski in goal made six saves against Huddersfield to finish on five. Jefferson Lerma bagged his first Cherries goal on the weekend, with a low swooping header from Ryan Fraser’s corner. The Colombia international, for just £4.5 million, could be a steal, having played all but 45 minutes since September’s fixture against Burnley. 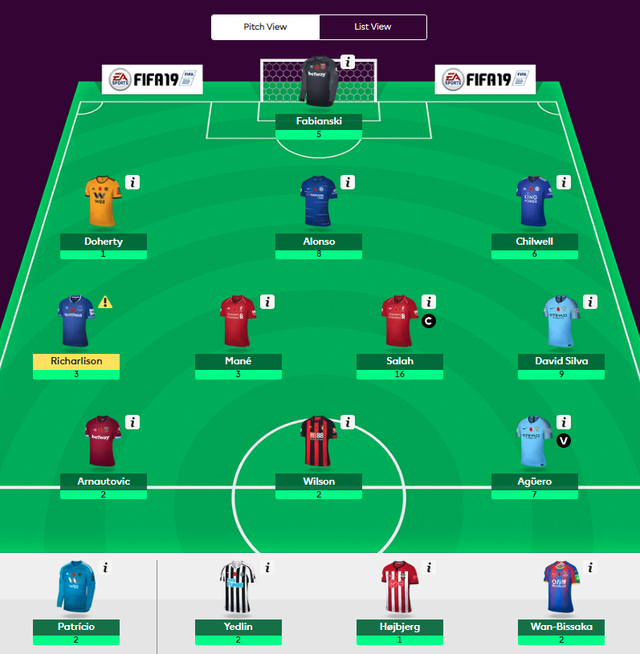 Additionally, just 0.4% of players have the midfielder in their side, meaning a big points haul in the coming weeks could be of huge benefit.